Doctor Tremor Harding, a middle aged, reknown laser researcher, resident in the small town Lagendonk- a place out of time and space- is a satisfied man. His life has already had a considerable amount of pleasurable and interesting experiences he is thankful for- he can not think of more he wants to accomplish. The experiment is performed in an optimistic, scientific and systematic spirit, and is both a one month long feast and a journey towards new realizations. «Zero Plus» is an outrageous and at the same time fascinating novel – in other words, a book in the typical and intense Nygårdshaug style. Masterfully, the author combines the comical and the macabre, myth and science, play and logic. Another strong encounter with a different author. Gert Nygårdshaug is describing a world that "hits you" and even the most unthinkable ending of a story seems quite natural to the reader. You think "Yes, of course." Challenging, encouraging, enriching. 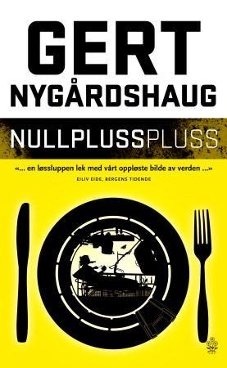 Nullpluss confirms Gert Nygårdshaugs position as an authors originality that can not be matched.